26w6d: Wife May Do Pregnancy Classes Alone...Boo! I think we are at the height of our stress in this transitional life phase. Our hope is that none of this is phasing Baby G. We are most definitely starting to feel the crunch time being upon us. Fully realizing stress is not good in a pregnancy but we are doing the best we can with all that's on our plate right now. Oh yeah, and there is this little thing called we are moving while wife is six months pregnant. Have I mentioned we do not have a house yet, nor do we have any idea where we are going to live? I enjoy quiet time in the evenings either listening to or feeling the baby move or kick. While we are almost 27 weeks into this experience, it is still surreal to me that we are creating and nurturing a life. This is what being in awe is all about. Doesn't get more awestruck than this. We are so late in starting pregnancy classes too. As a team we decided that while not ideal, she will enroll in the next session and just tell me about them in what was routine over the last month: Nightly Skype/Facetime sessions. Boo! Boo! Boo! In the meantime, looking for a doula to assist us in the delivery room is on the to do list. A doula is like a mid-wife that helps with soothing and comfort during labor. 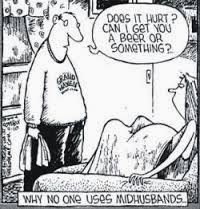 Why can't I be a mid-husband? Can someone please stop the clock a bit?